You may also pay for the banquet by visiting the SCGP Cafe on the 2nd Floor of the Simons Center for Geometry and Physics during normal cafe hours (12 – 2pm, weekdays). Cash, Check, and Credit Cards are accepted at the register. 1. Studying the parallel between dynamical systems and category theory based on recent works by Kontsevich and Soibelman and Dimitrov, Haiden, Konstevich, Katzarkov. 2. Developing a geometric approach to stability conditions and moduli spaces of Landau Ginzburg models. 3. Understanding recent work on Landau Ginzburg models by Gaiotto Moore and Witte. 4. Developing theory of sheaves of categories over Lagrangian skeleta. 5. Understanding recent work of Gaiotto, Neitzke and Moore and Vafa in connection with Harmonic maps to buildings. 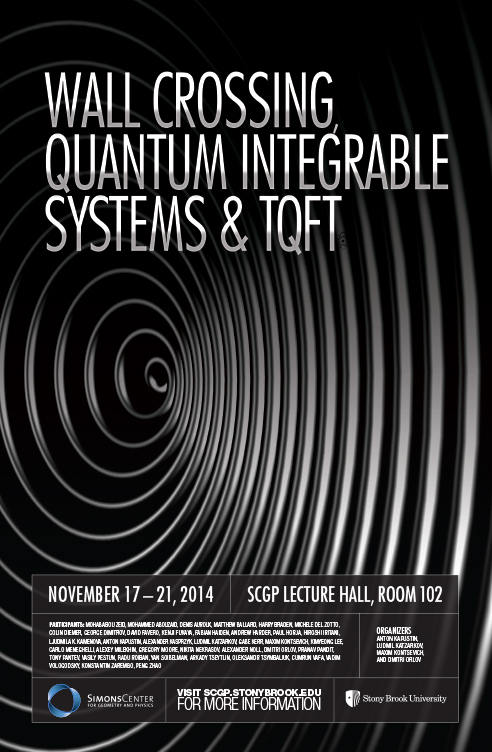 This workshop is a part of the Fall 2014 program, Gauge Theory, Integrability, and Novel Symmetries of Quantum Field Theory, which is organized by Anton Kapustin, Nikita Nekrasov, Samson Shatashvili, Volker Schomerus, and Konstantin Zarembo. This program takes place from September 2 – December 19, 2014.